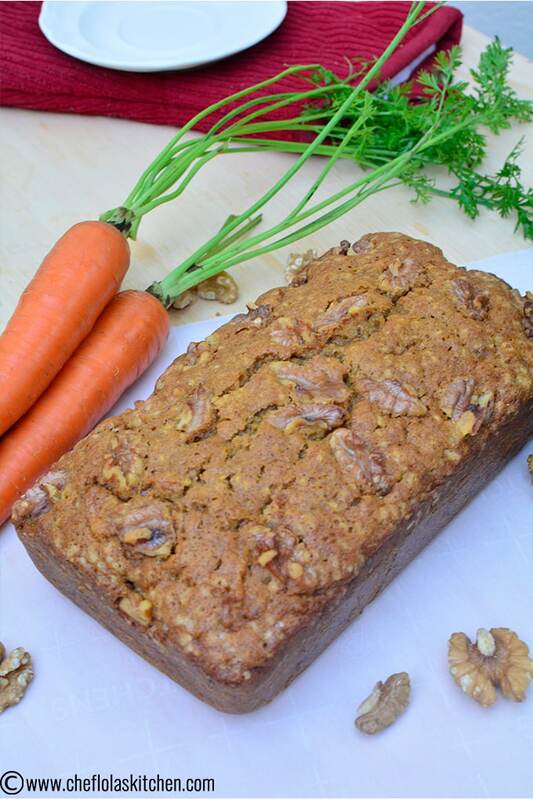 Easy Moist Carrot Cake From Scratch – This homemade carrot loaf cake is a delectable, tasty and mouthwatering dessert. 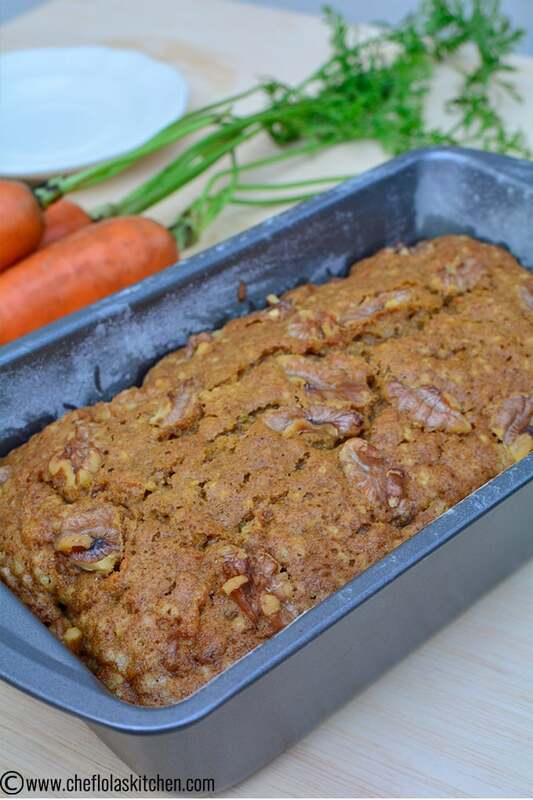 It uses fresh Carrots, walnuts and aromatic spices like Cinnamon, Nutmeg, and cloves. 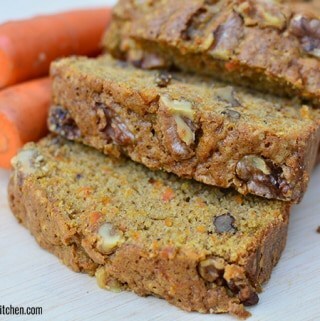 This delicious decadent Carrot cake is anytime indulgence from breakfast Tea to appetizing dessert to birthday cakes to potlucks and the list goes on and on. 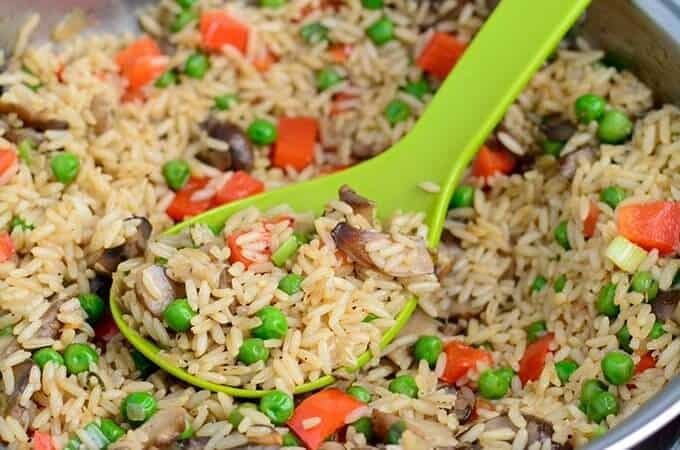 It’s moist, flavorful, and easy to make. 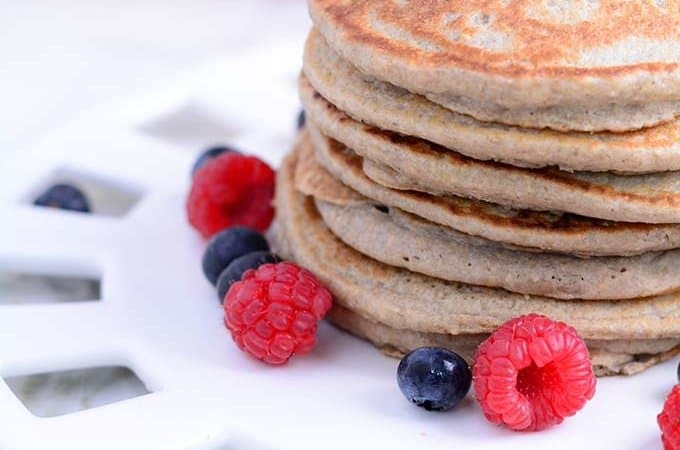 Unlike the Banana bread or the plantain cake in which you can feel taste the bananas or the plantain as the case may be, this cake does not taste anything like carrots. The spices are well coordinated enough and that is what you will taste when eating this cake. Don’t worry the spices are not overwhelming. I usually don’t add dried fruits like Raisins in my carrot cake. I always like to keep it simple, however, it doesn’t hurt if you like the extra. 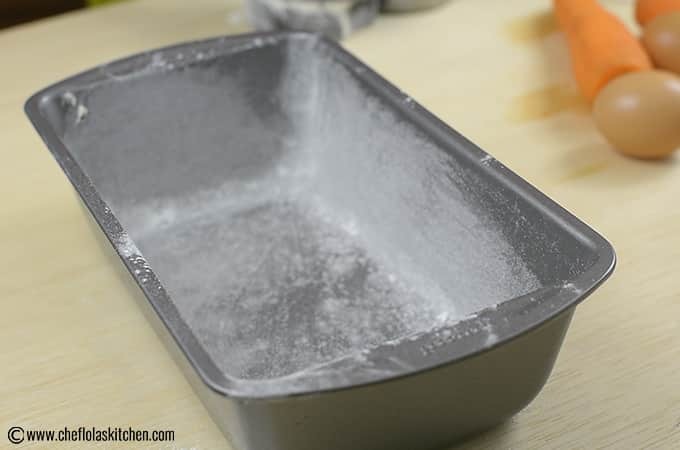 Preparing the pan – The first thing to do is to grease and flour a 9×5 loaf pan. Ensure every part of the pan is touched by the butter. 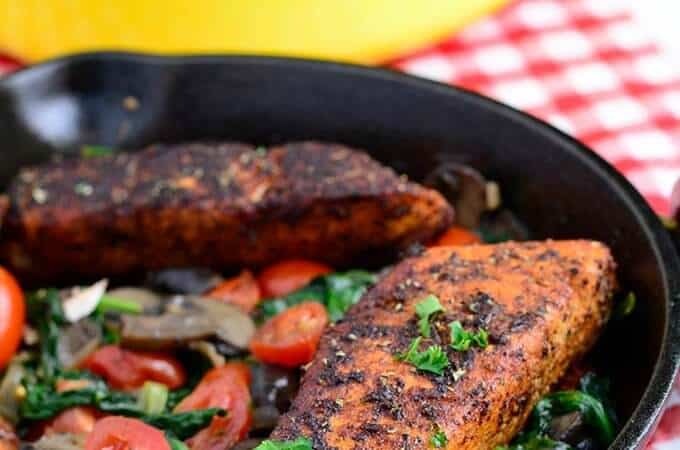 Once that is done, sprinkle some flour on top of the greased pan now lift up the pan and continue to juggle it all around until the flour spreads all around the pan leaving no space untouched. Then set it aside. 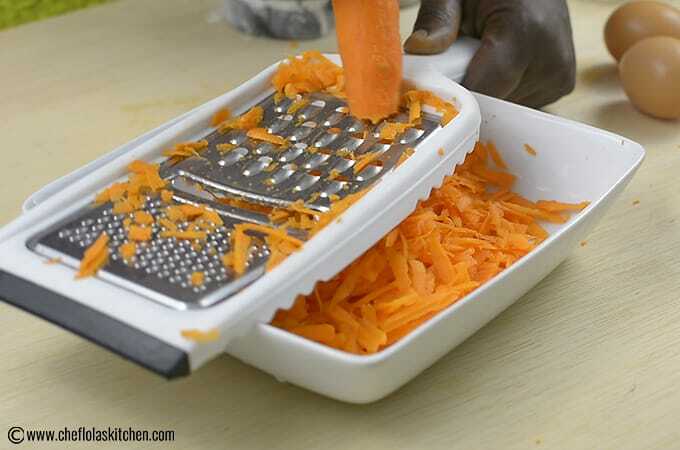 Grating the carrots – Something I also like to do is to grate my Carrots by myself. It’s okay to buy the grated carrots from the store, however, I like to use my own freshly grated carrots because I like the taste it gives my carrots Cake whenever I make it. 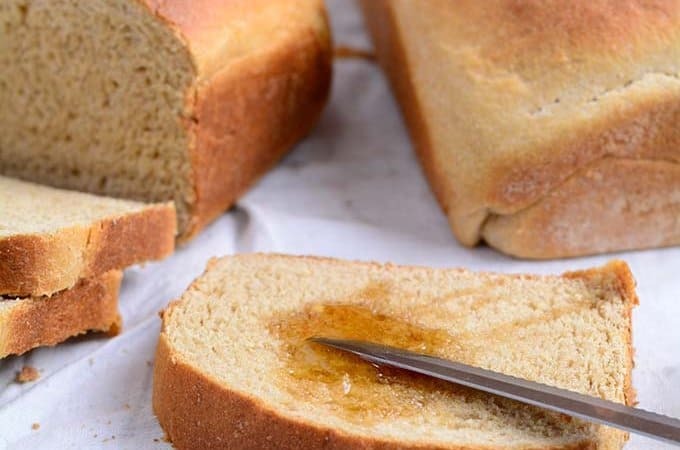 Dry Ingredients – ln another bowl, measure out the all-purpose flour but make sure all your measurements are leveled in order to get the perfect cake. Better still, you can weigh out your flour on a scale. (Check the equivalent conversion below). 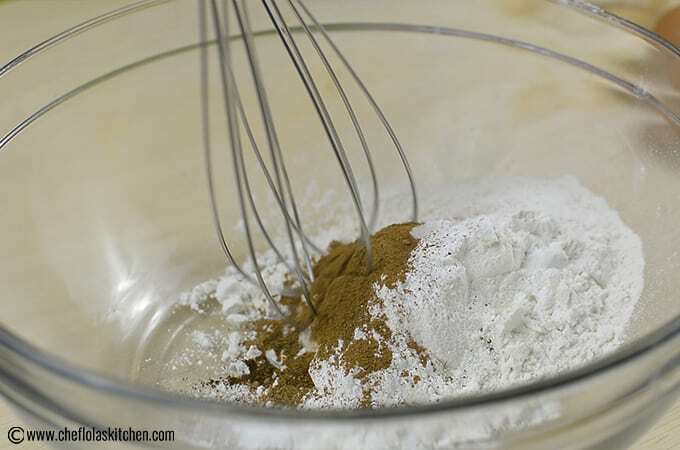 Combine the flour with the baking powder salt, nutmeg, cloves, and cinnamon. 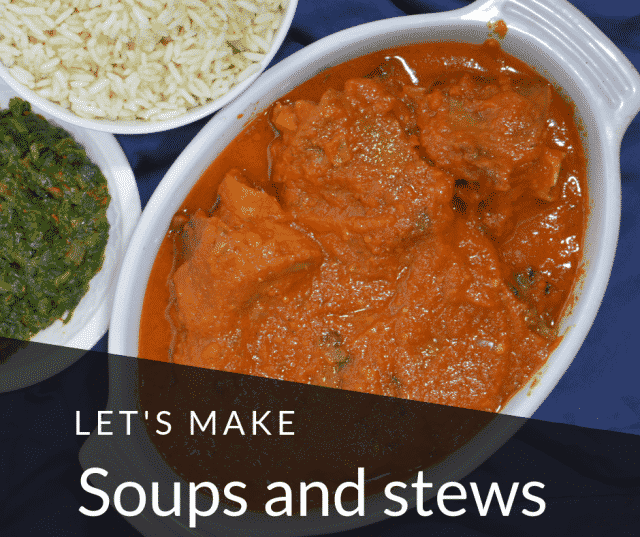 Wet Ingredients – Let’s now combine the wet ingredients. Whisk the Eggs and the Sugar with the electric hand whisk until it becomes light and fluffy and this will take around two to three minutes or anywhere in between. It’s now time to introduce the oil inside the mixture. Whisk this together until the oil is totally incorporated into the mixture and this should take about a minute or two at this point. Also, add the Vanilla extract and whisk that together as well. The mixture is getting together pretty well right now. Next thing is to fold in the Carrots. 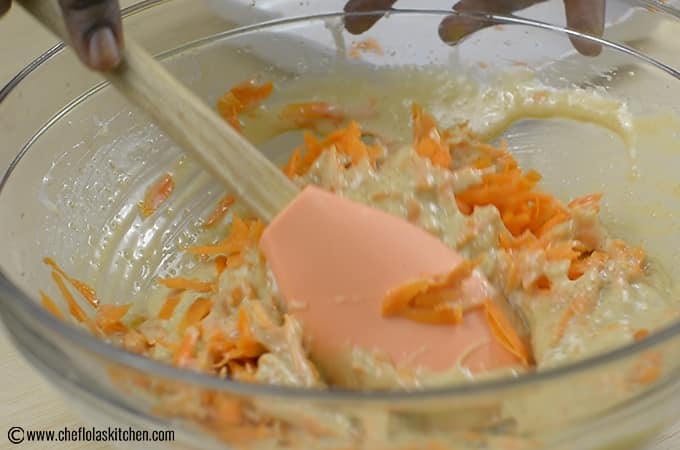 You don’t have to use any hand mixer for this at this point simply use a spatula until the Carrots is well incorporated into the mixture. 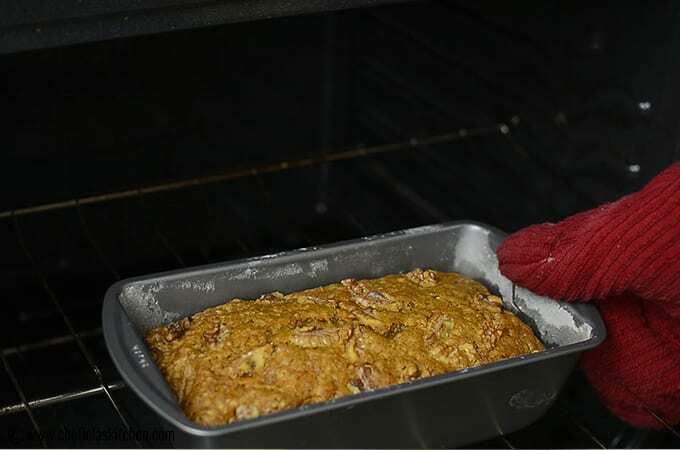 Combine the wet and the dry – Next, fold the flour, then the nuts until it’s just combined and make sure you don’t over fold this mixture otherwise the gluten in your flour would develop and this will result into a dense and chewy cake which is a no-no. Pour the batter into the prepared pan. Finally, before this goes into the Oven, I like to sprinkle some broken nuts over the batter. I used walnuts today, however, Pecans are a perfect option you can also go for. 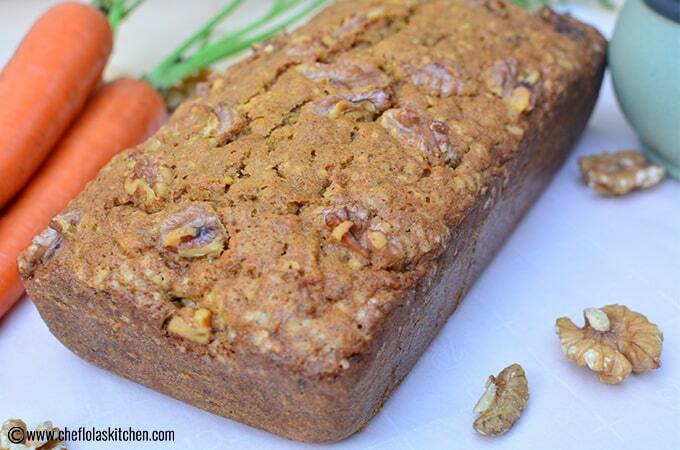 Easy Moist Carrot Cake From Scratch - This homemade carrot loaf cake is a delectable, tasty and mouthwatering dessert. 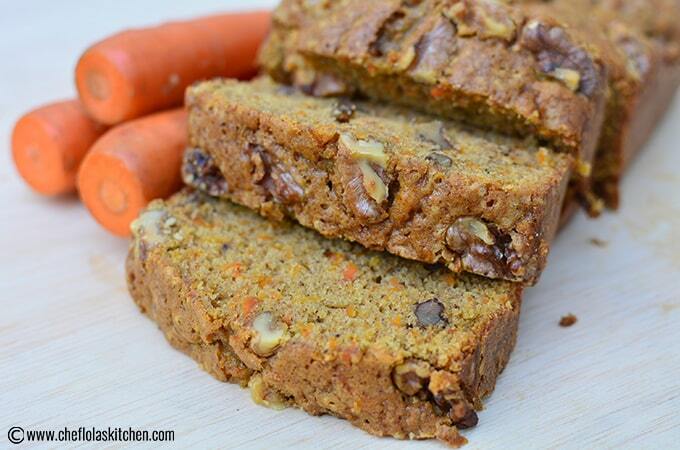 It uses fresh Carrots, walnuts and aromatic spices like Cinnamon, Nutmeg, and cloves. Grease and flour a 9x5 loaf pan with some room temperature butter. 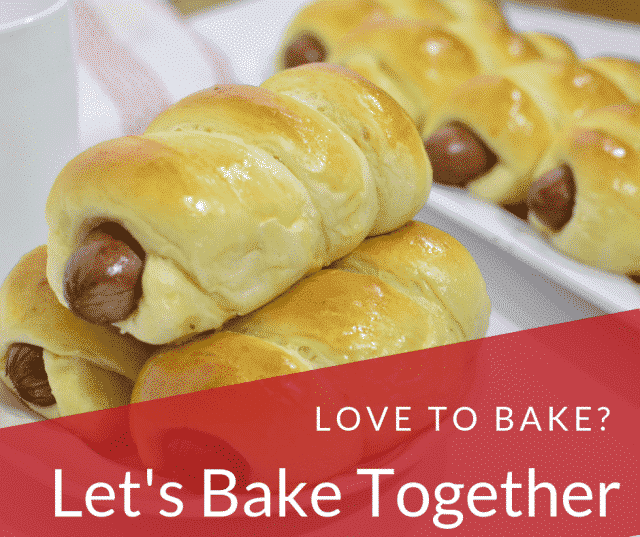 Combine the Flour, Salt, Baking powder, nutmeg, cloves, and cinnamon. Whisk together and set aside. 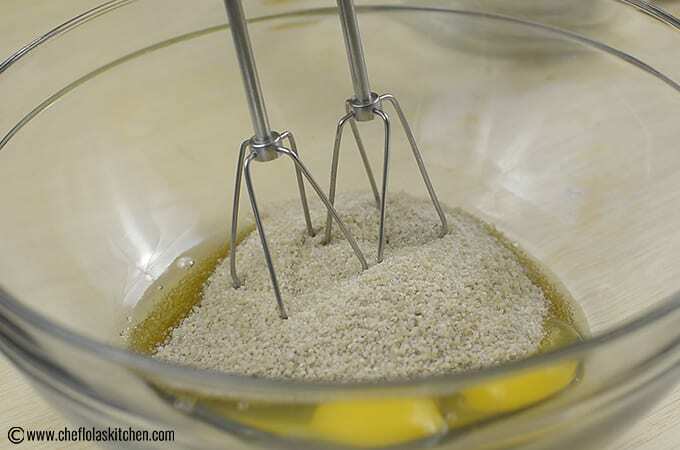 Whisk together the Eggs and sugar for about 2 to 3 minutes. 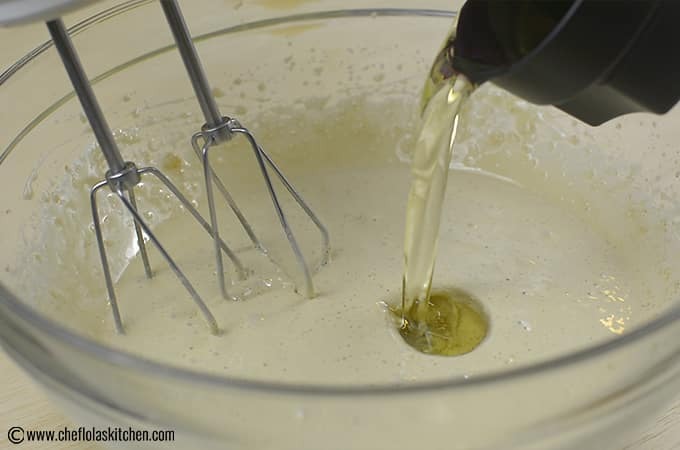 Add the Oil and the vanilla extract whisk together again until the Oil is totally incorporated into the mixture. 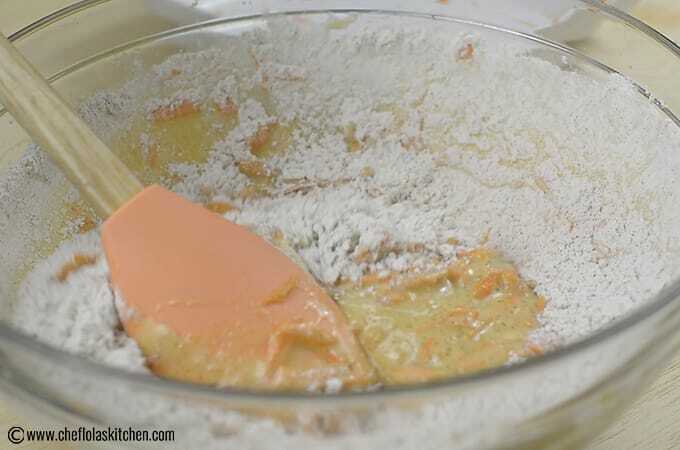 Fold in the grated carrots and once it's well combined, fold in the flour till it's also well blended with the mixture then fold in the nuts till everything is well combined. Pour the batter into the prepared pan then sparingly sprinkle the broken nuts on top of the batter. Leave on the table top to cool down before serving. Just came across your recipe this morning and baked this cake with my toddler. The cake is a hit, moist and delicious. Thanks so much for such an easy and fantastic recipe. Thank u so much for this website. God bless u! It has been extremely helpful. The only ingredient I think you can substitute is the Oil. You can go for Coconut Oil. It will reduce the calorie a bit.